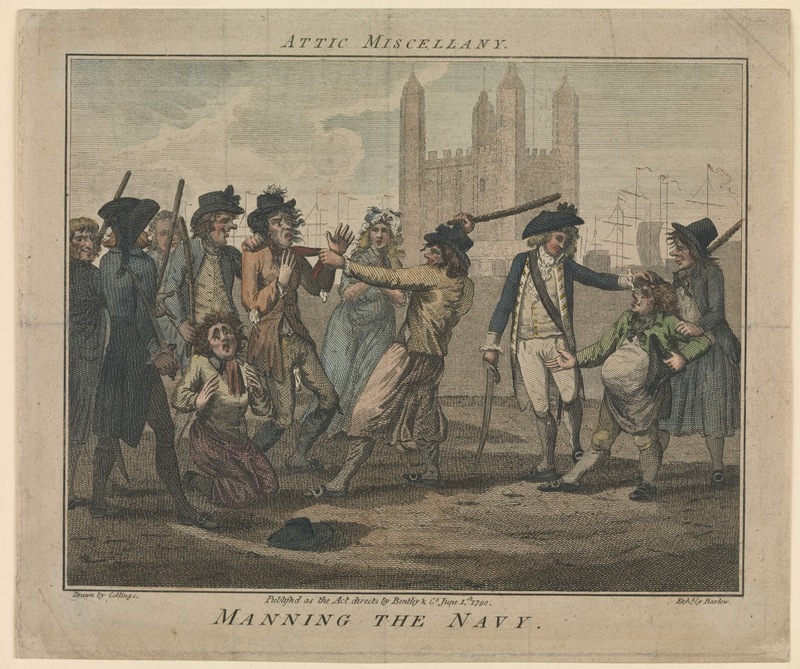 Attic Miscellany, Manning the Navy, J. Barlow, 1790, National Maritime Museum. Another press gang! A pair of Naval officers guide their tars in rounding up men suitable for the service. On the right, a notably short and fat hobbit of a man is inspected by an officer while sailors rough up helplesss men on the left. 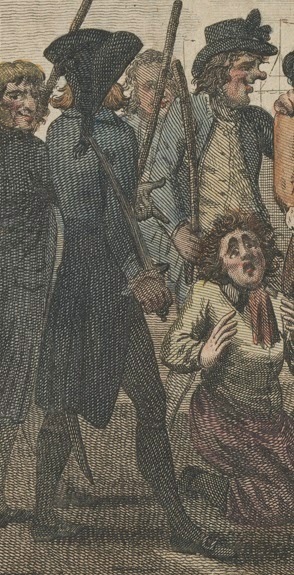 Starting on the far right, we find a jack manhandling the short and fat fellow for his officer. The tar wears a tall "coachman" style hat, though the brim is not terribly stiff, suggesting a loose material of some sort: possibly felt or canvas. His blue jacket is simple and ends just at the top of the thigh without pockets, cuffs or lapel, but it does have a collar. There appears to be no waistcoat, but just a white shirt and black neckcloth. Unlike virtually every other example we've ever seen, this sailor wears a pair of blue slops! Besides that, he wears white stockings and pointed toe shoes. To the left of the officer is another mariner. 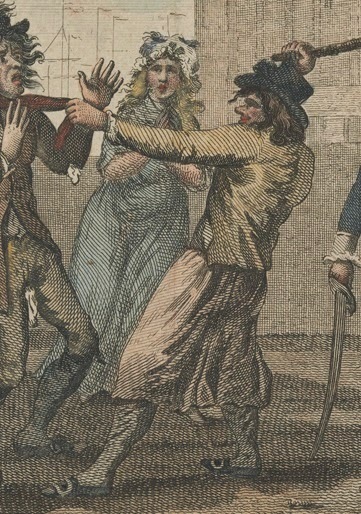 He bears a cudgel, ready to bring down on the head of the fellow he grasps by his cravat. This seaman, too, wears a tall "coachman" style hat and short jacket. His short jacket is of a light brown or dusty yellow color, and is lined in white. The slops are beige in color, perhaps meant to represent old sailcloth. In the typically disheveled fashion of sailors, his stockings are baggy. Another cudgel wielding jack stands with his hand on the shoulder of his shipmate's target. The crown on his hat is shorter, but it is the same style as the other two sailors, and (as with the sailor in the middle) his hat is fitted with a black bow. A blue jacket is worn over his white single breasted waistcoat, and his neckcloth is tied around his neck and stuffed beneath the waistcoat.